It is possible to create Flash applications from Linux using only free tools. It’s also easy! The Flex SDK contains the compiler you’ll be using. Flex is also the name of Adobe’s Flash-based UI library but you do not need to use any Flex components to use the Flex compiler. You can find it easily by searching for “flex sdk”. At the time of writing the most recent version can be found here: http://www.adobe.com/devnet/flex/flex-sdk-download.html. Older versions can currently be found here: http://sourceforge.net/adobe/flexsdk/wiki/Downloads/. You want to get the “Adobe Flex SDK” rather than the “Open Source Flex SDK” because the Adobe one comes with the debug flashplayer program you’ll be wanting to use for testing. MXML is an XML schema for laying out UI components, but you don’t need to (and don’t want to) create any mxml files to use the compiler mxmlc. I’ve heard this doesn’t do a great job of optimising, but no reason not to include it really. Specifies the filename of the SWF to be generated. Starting with Flex 4 I get warnings if I don’t include this parameter, and in some projects the application didn’t run at all without it. Target Flash Player 10 rather than the default Flash Player 9. Depending on the libraries you are using you can omit this. Generates debug information so you can get line numbers from stack traces. You probably want to disable this when compiling your final release. Flex 4 has an incredibly annoying backwards incompatibility with Flex 3 where embedded fonts will silently fail and no text is rendered. This is one solution to that problem, the other is to add the parameter embedAsCFF="false" to all font embeds in your code. This is used when you have a preloader. I won’t go into the details of using a preloader here, but when I compile with a preloader I use mxmlc [normal parameters] Preloader.as -frames.frame mainframe Main which compiles Preloader.as and Main.as separately. The Adobe Flex SDK (but not the open source Flex SDK) comes with a debug version of the Flash Player that will show error messages. Note that there should be two versions included: 10.0 and 10.1. I have not been able to get the 10.1 player to output trace statements so I use the 10.0 player for debugging. You might notice that compiling using mxmlc takes a very long time. This is because it has a lengthy startup time and doesn’t keep anything in memory for future compilations. There is another tool in the Flex package to help solve this problem called fcsh (the Flex compiler shell). Running fcsh will give you a shell, and typing mxmlc commands into that shell will cache some results for improved speed. Unfortunately this is a horrible way to work: you don’t want to use a specific shell for compiling, you just want a standalone command that can be run from bash, or from a makefile, or from wherever. To solve this problem I wrote fcsh-wrap. You use it as a drop-in replacement for mxmlc and it will use black magic to speed up your compile times. There are also similar scripts available for emacs which I have not used, and hopefully any AS3-supporting IDE will have fcsh support built-in. Update: if for whatever reason you can’t or don’t want to use fcsh or fcsh-wrap, setting -incremental=true will give you some of the same performance benefits, although it will still be slightly slower. Speaking of which, what AS3-supporting IDEs are there for Linux? Obviously you don’t need an IDE because I’ve been talking about the command-line compilation toolchain. You can use any text editor you like: personally I use Sublime Text, obviously the vi/emacs fans will choose to use vi and emacs. For Sublime Text, you want to install the ActionScript 3 package through this package manager. For gedit, you can get AS3 syntax-highlighting support from here. In terms of actual IDEs, there seem to be two choices. They both have a pricetag attached, but I believe they are both free for students or for development of open source projects. IntelliJ IDEA is a Java-focused IDE, but the Ultimate edition comes with AS3 support. Comes recommended by Daniel Cassidy. FDT is a Flash-focused IDE. Looks worth checking out but I have no personal experience of it. This isn’t Linux-specific of course, but I think it’s relevant and useful to mention these here. Again not Linux-specific but someone mentioned that this would be useful information to include. I tried to embed the cross-browser SWF embed code into this post but it screwed up. Have a look at the SWFObject documentation (the “static publishing” section): you only really need step 1. Doing steps 2 & 3 as well will let you detect whether the user has the right version of Flash installed. Note that the SWF is embedded twice (for different browsers) so if you change its filename or its size, you need to change that in two places. I think that’s everything that you’ll find useful. I’ve been making Flash games in Linux for over a year and a half now and I’m really happy with the tools available. Hopefully you will be too! If anything here is unclear or you’re having trouble getting it set up, leave a comment below or send me a message on Twitter. 2010 has been a really great year for me. I’ve met a ton of new and exciting people, made a bunch of games that I’ve enjoyed working on, and I feel I’ve vastly improved as a game designer over the course of the year. 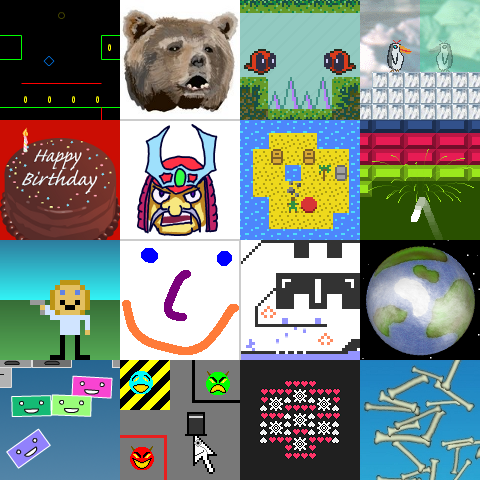 I had the idea for this game way back in 2009 when I was thinking of themes for one-week challenges and thought about a one-button challenge. Then the GAMMA4 theme was announced and I decided to prototype it in 48 hours for Ludum Dare 16 (exploration). The idea as it was originally was that when you press the button down you do one action (jump) and when you release the button you do another action (flip). What I submitted to Ludum Dare was not a good game for a number of reasons (among other things, I’m pretty sure only one other person in the world ever completed it) but I was sure the idea had potential so I kept working on it for GAMMA4. Playtesting in real life showed me that my game was even less playable than I thought it was: possibly it is my most inaccessible game ever and that’s quite an accomplishment. I found it necessary to change the control scheme from press=jump and release=flip so that instead every time you press the button it jumps or flips alternately. That was very disappointing (it was the original idea after all!) but that control scheme was no longer the central part of the project in my mind: the Ludum Dare prototype had given me a better idea of what kind of puzzles the game could involve, which wouldn’t be affected by the new control scheme. Unfortunately, further concessions to accessibility meant making other changes to the level design. In hindsight I feel these changes took me away from my vision for the game. The biggest problem (though not the only one) stopping me working on the game at the moment is that I feel it should be about exploration (something more obvious in the LD version than in the most recent one). I don’t know how to create a world that players will want to explore though: it’s just not something I have any experience of. So it’s become this big daunting project in my head that scares me when I think about it. Currently I don’t think I can do the game justice but I will make it eventually. You probably won’t see it in 2011 though. 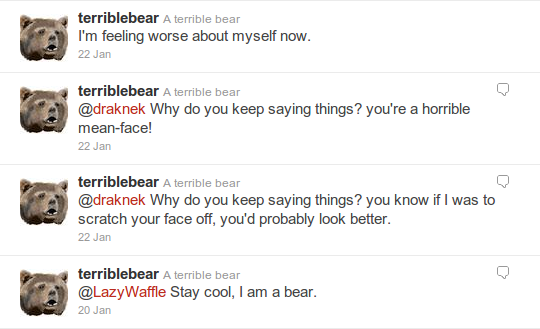 A collaboration between George Buckenham (v21), myself, BorisTheBrave and Jim Riley to create a depressed Bear who uses Twitter. If you send him positive messages he would become happier and if you send him negative messages he would become sadder. He’s currently hibernating so won’t respond to you, but some day I think I will need to wake up Terrible Bear. He is just too terrible to remain in hibernation forever. TIGJam UK2 was the first physical game jam I’d ever been to (apart from the Warwick Game Design 48 hour competitions) and I had a really great time there. The concept of a three hour game was strange and concerning to me, but I gave it a shot. My first attempt, BubbleSun, was not a success but I think Doppelganger was much better. The idea I had for the “reflection” theme was two player characters on opposite sides of the screen which move in opposite directions. The aim is to get each of them to the other’s spawn point, but they will get in each other’s way. I recruited Lifesnoozer to make some graphics while I rapidly hacked apart the Robo-Jimmy codebase. Lifesnoozer also made most of the levels. I’m sure that there is an interesting puzzle platformer here, so I will eventually go back and create more levels for it (and probably rewrite it in FlashPunk). A couple of weeks later I took part in the Global Game Jam from Bristol. 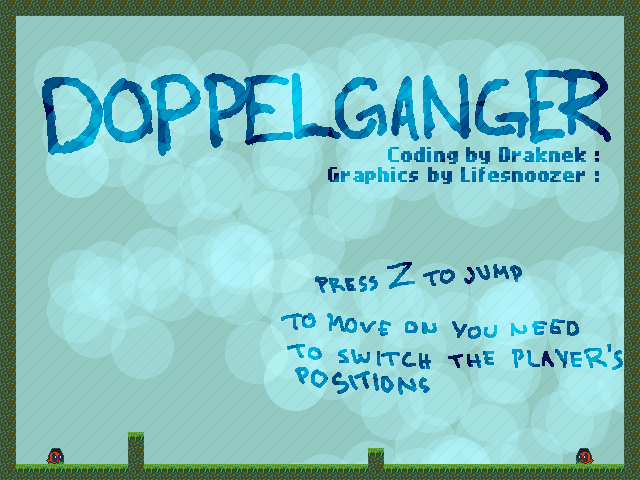 I teamed up with Mirek Salmon and Enno Slocinda (who for some reason decided he needed to use a pseudonym and wouldn’t tell us his real name) to create another platformer game using the Robo-Jimmy codebase (we also stole some of the levels from Doppelganger). The idea this time was also based on reflection: on one side of the screen you would be able to see the player character normally, but on the other side of the screen the player would be invisible and you would only be able to see your reflected image on the other side of the level. 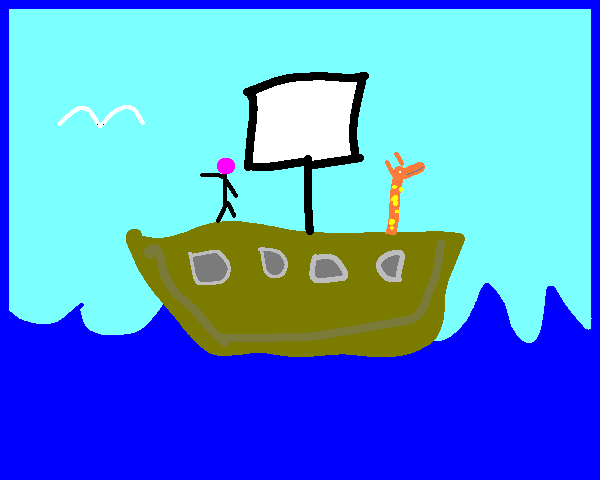 At the time I wasn’t very happy with this game idea which impacted on my enthusiasm. Playing it again now, I think I was being a bit too negative although this implementation of it is still very poor. I accomplished everything I wanted to with this game. My only regret is that it doesn’t tell you that there are 23 levels so I suspect most people didn’t see the punchline. The awesome music is what makes it work for me. I found it by searching for “birthday” on 8BitCollective and there was the perfect audio track just waiting for me. For most of the year, this was my most-played game due to Hennell linking it on Reddit. 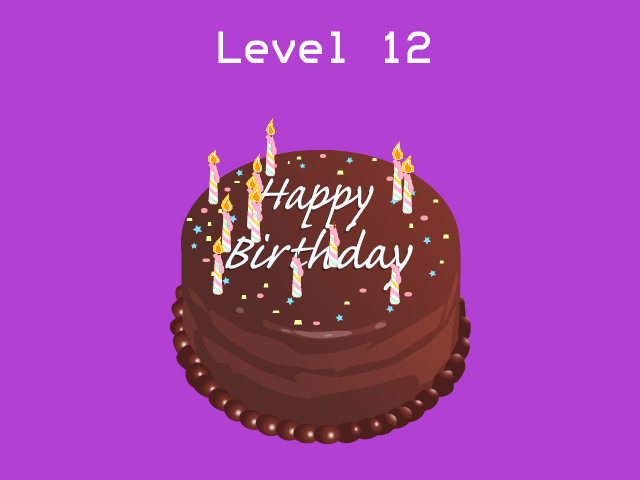 Awesomely, one redditor actually wrote a script to click on the candles for him to try to get past level 23. I teamed up with my brother Phil and Ali from Warwick Game Design to make a game for PyWeek but none of us ended up having really any time for it. End result: nothing worth playing. The idea was to make something which is half balance-game and half platformer, with the player trying to get higher and higher while trying not to fall off any of the tilting platforms. 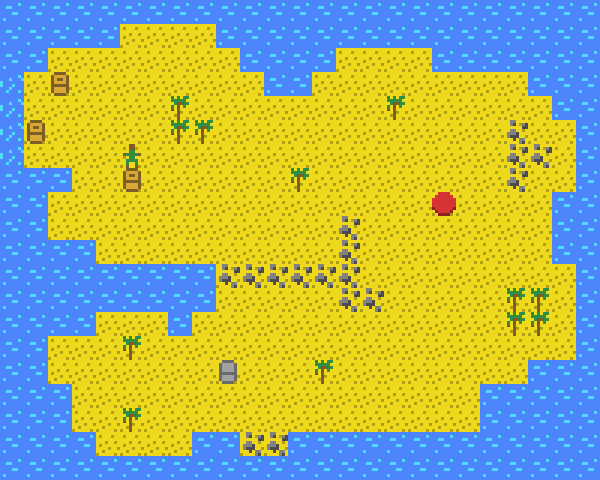 I procrastinated all of Saturday trying to think of a game idea I wanted to make for the theme “islands”. Finally on Sunday I just gave up and decided to make something like Sokoban with water currents inspired by Rescue Rover. I was wanting to try my hand at narrative but due to the late start never got the opportunity. I was also wanting to make allusions to Lost, so the player was going to have to press the button in every level in 108 seconds. That never got added but the title stuck. Graphically, I chose to restrict myself to 8×8 tiles/entities with two colours per object. I’m actually still pretty happy with the result when it’s not animated (with the exception of the player sprite) although other people certainly disagree with me here. 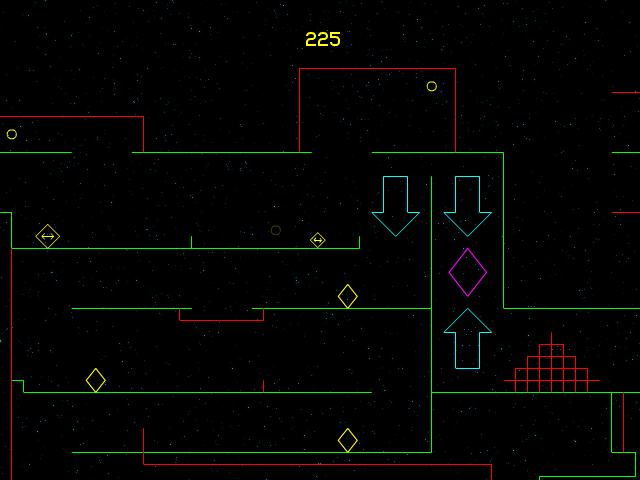 I made three trivial levels followed by a ridiculously hard level followed by an actually impossible level. Another successful difficulty curve then. I might revisit this game sometime if I have a craving to create lots of puzzle levels: I found Sokoban fairly rewarding to create levels for. This was the first time I tried FlashPunk, and afterwards I started using FlashPunk for pretty much everything. Eight months on and no regrets. A Breakout clone with a twist. I am fairly happy with how this turned out but I do wish there was something more to it after the twist comes. The number of three hour jams at TIGJam UK3 was a bit insane, I started something like eight games over three days. Not all of them worked out, but those that did I’m happy with. This is a two-player duelling game, there is no point playing it unless there are two of you. The very final jam at TIGJam UK3 had the theme “paint program” and I made one where the brush runs away from your mouse cursor. It’s practically impossible to draw anything, but I am happy enough with the result. This is my favourite game of the year, and also the most-played (thanks Reddit!). 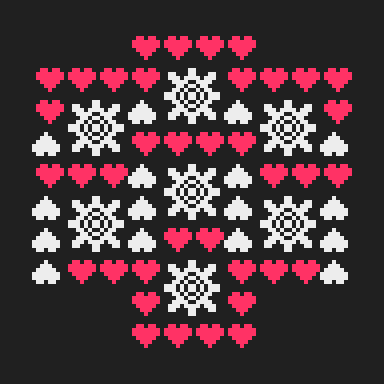 It started out as a VMU (48×32 pixels, 1 bit colour) demake of Run/Jump/Flip at TIGJam UK3. Then I realised that a VMU demake of Mindbender would be better (because that would mean four 24×16 screens). 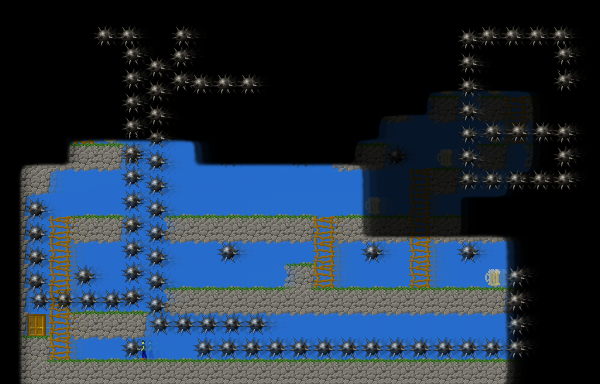 I got the pixel-platformer engine working there but didn’t get close to finishing the demake. 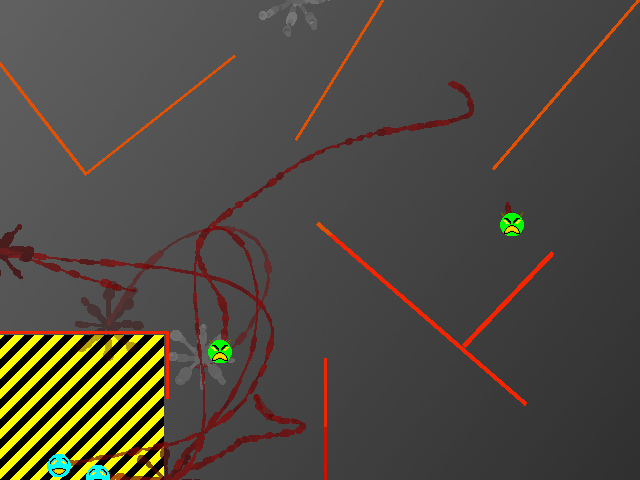 Then at the World of Love Jam there was a jam with the theme “traps” and I revisited the codebase and added moving obstacles. 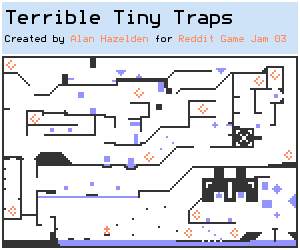 I kept getting really weird problems though and didn’t have time to do any level design. 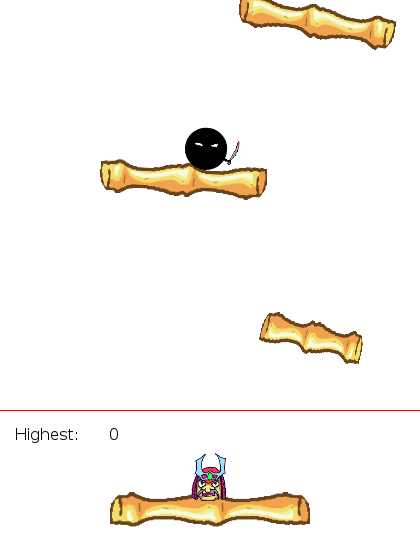 Finally for the Reddit Game Jam (theme: 300×250 resolution) I turned my test level into an actual level. It wasn’t a great level though: it was too open-ended and there was no reward for collecting the arbitrary collectables (and nothing even happened when you collected everything). So two weeks later I released an update. Now when you reached some checkpoints part of the level would be activated and start moving, opening up access to more sections. This made it less open-ended and helped to focus the player, as well as being a kind of reward for getting further. The difficulty was pretty high but I was finally happy with this version. It didn’t get much feedback though and I forgot all about it for a while. Fast-forward three months to November and it goes into the Reddit ad rotation. I also submit it as a link at this point. All of a sudden people are playing it, and most surprisingly of all, enjoying it: despite or perhaps because of the steep difficulty curve. With the new attention I’m motivated to add a small number of extra features including a no-death mode. While playtesting it I get to the final trap and then it kills me brutally. “No one will ever beat this,” I thought. How wrong I was. I put the game on FlashGameLicense but so far nobody has made any bids. My suspicion is that the combination of super low-res graphics and a very high difficulty curve makes it not particularly sponsor-friendly but I also probably haven’t done as much as I could have to attract their attention. I travelled up to Cambridge for Ludum Dare 18, to work at CB2 with other people around. That was good for motivation; I had been worried I’d have a repeat of the last Ludum Dare and wouldn’t start anything until the Sunday again. The concept for this changed several times over the course of the competition, but eventually it became about smashing into asteroids with your invulnerable ship to stop them hitting the Earth (which is flying through hyperspace at ludicrous speed after the planet had to be relocated). 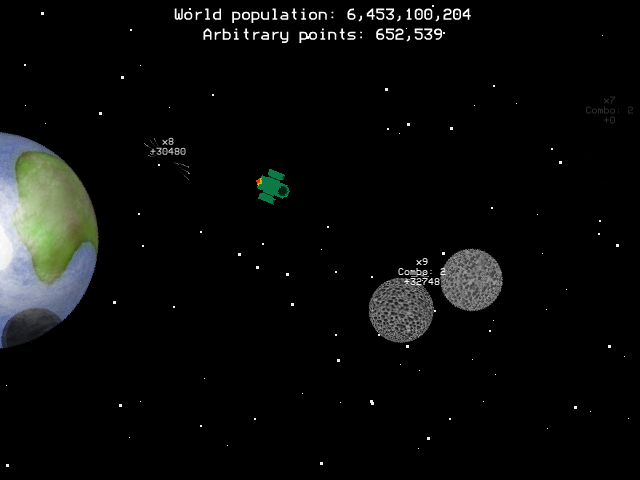 You get more arbitrary points for smashing asteroids into each other. I think the core gameplay is fun but there would be a lot of work to realise its full potential. Still, it’s on my “would be worth revisiting this” list. Breakout with physically simulated bricks? Sounds like fun! What if you had to catch them on your paddle and you didn’t want them to fall off? That is pretty much the thought process that created this game: it just came to me as a complete concept. 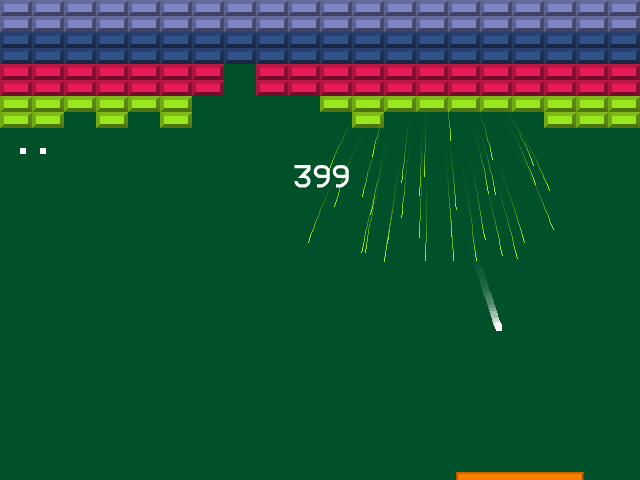 Once I had the core gameplay in place I decided to experiment with adding some character to the bricks. Smiling faces and an appropriate background immediately made it 100 times better. Now I am waiting on some appropriately happy music and when that gets here I will hopefully be motivated to start working on this again. I found the theme “evil ventriloquist’s dummy” really hard to work with. I feel like I let my teammates down a lot on Saturday, I really wasn’t motivated and I was an awful project leader. On Sunday I finally worked out a game idea that would work (really quite close to the first idea I considered on Saturday but then decided it wouldn’t be fun): you have to herd evil ventriloquist dummies to the de-evilifier but if they touch the evilification walls they will go mad and start to chase you instead. I really underestimated how much of a user experience problem it would be to use the normal cursor as a game entity: people don’t seem to realise that. So that is a useful lesson. 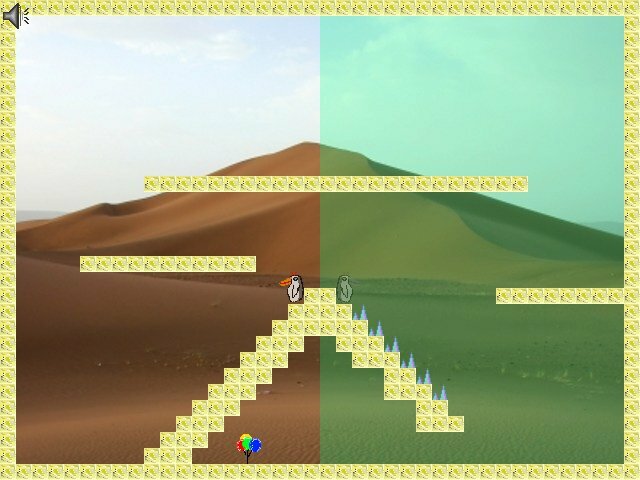 Also using a bitmap image as the level format and pixel-based collisions means that the walls are annoyingly sticky: if I were to revisit this concept I’d need to rewrite it to use vector-based walls. I had some really positive feedback on this from one person, so perhaps it is worth continuing with. I didn’t get around to starting anything for the FlashPunk Game Competition until four hours before it ended, but fortunately I had a good idea in my head of what I wanted to make and I knew it could probably be done in four hours. The idea was a puzzle game with similarities to a 2D Rubik’s Cube and I was right that it could be quickly implemented. I had time to make seven levels but had no idea how hard they would be. Turns out: very hard. Since then I’ve worked up to 30 levels and the difficulty curve is slightly better but still pretty steep. The problem is that I’m not entirely sure how to teach the player what they need to learn: I had hoped that throwing more levels at the problem would work but no such luck. By level 6 something like 80% of players have dropped out which isn’t great. I have experimented with adding narrative to the game, which I am broadly very happy with. It’s something I haven’t done a lot of in the past, but I think it works well here. The ending still needs work though. As of yet, nobody but me has completed the final level. 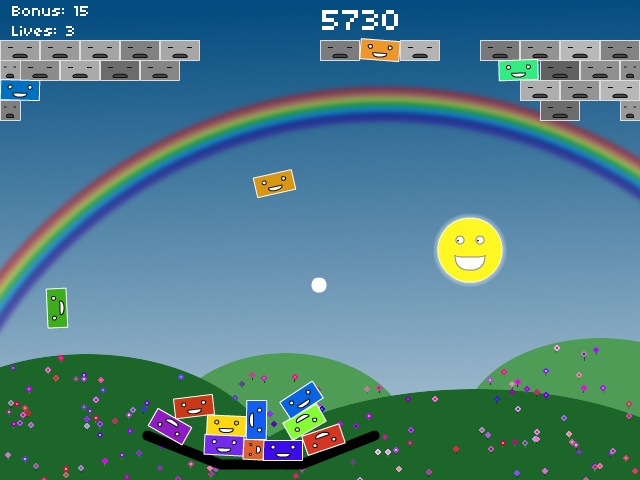 What I might end up doing is move the harder levels to a set of bonus levels. I went up to Cambridge again for Ludum Dare 19 and the game I made is entirely the product of the lovely people who were there: without their suggestions and inspiration I would have made something far less interesting. I wasn’t feeling inspired by the theme on the train up there but eventually I thought of making some kind of paleontology game. 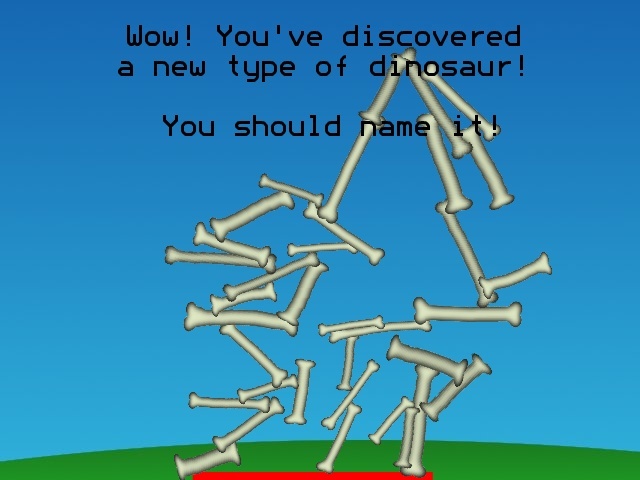 My first idea for that would have been incredibly boring and my second idea was a total rip-off of Radical Fishing, but after some encouragement I started working on the original part of it, which was creating a dinosaur skeleton out of falling bones. That turned out pretty fun although entirely non-gamey, but on the walk back to the house on Saturday evening with Stephen/Terry/Sophie/Jonathan someone suggested the idea of being able to upload your dinosaur and challenge other people. Originally they were fighting but then someone observed they looked more like they were dancing, and so Dinosaur Dance-Off was born. It is pretty bare-bones (ha ha ha I am hilarious), as per usual for a Ludum Dare entry, so there’s more work required if I want to turn it into an actual game. And finally, a game I’ve been working on with Sam Gynn since the start of May. It is a port to Flash of one of his old games, so I’m not entirely sure how it’s taken this long. The idea is that you’re trying to drink all the beer found in each level, but each drink you take will make you more and more drunk. This game I’ve never publically linked to anywhere, you will have to wait just a bit longer to play it. It includes some lovely music by the talented Philip Cunningham. 2010 was a great year for me and 2011 has the potential to be even better. Time to make that happen then.